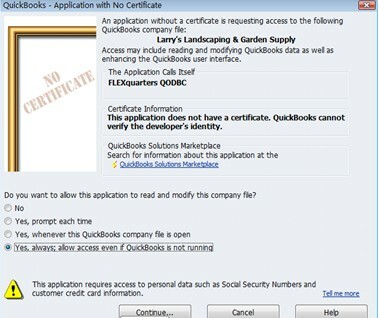 The QODBC Driver for QuickBooks runs differently under Microsoft Vista/W7 than other versions of Windows because of its new strict security settings. UAC (User Account Control): is new technology in Windows Vista onwards to improve system security which asks all users permission to run programs and tasks under a standard account module. It can prevent the installation of programs without authentication and can also prevent an un-appropriate change of the system setup from a standard user. 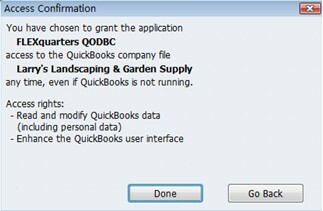 If a button is not available in QODBC, it means that you have forced Administrator rights. The setup must be run without "Run As Administrator" and UAC must be turned on to activate these buttons. 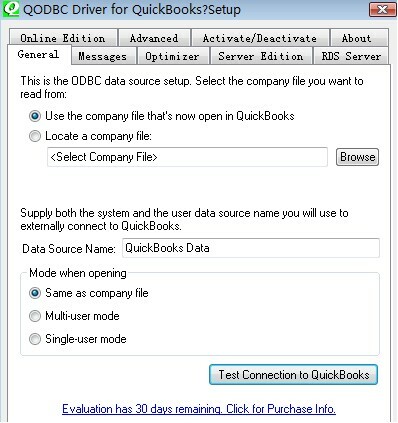 Close QODBC Setup Screen, Close Data Source Administrator ( if Open). If above does not resolve the "Test Connection" Grayed out the issue, Please follow steps. In case you are still unable to get "Test Connection" Button enabled, Close QODBC Setup Screen, Close Data Source Administrator ( if Open). 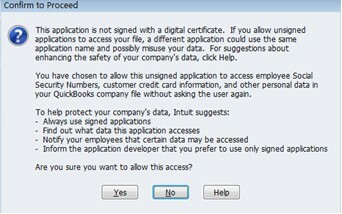 In case even after setting the correct UAC, the button "Test Connection to QuickBooks" does not enable, You can still make a connection to QuickBooks. 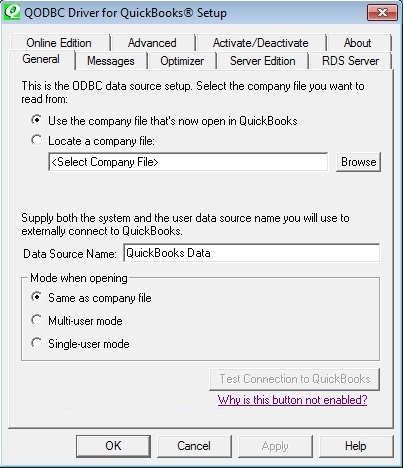 Use VB Demo or any other application like MS Access, Excel or your custom application and connect to the DSN, it should get connected ( even thou "Test Connection to QuickBooks" is not enabled. I tried all this and my button is still disabled. Any ideas? I've tried installing demo versions of QuickBooks Premium and Reckon Accounts, for Australia, and I can't connect. [QODBC] QB Begin Session Failed. Error = 80040408, Could not start QuickBooks. Eval on windows server. UAC off, but when testing connection gives an error "security issue". Please advise..